Andy over at Action Figure Blues wrote a great review of two recent DC Direct Brightest Day figures - Mera and Firestorm. 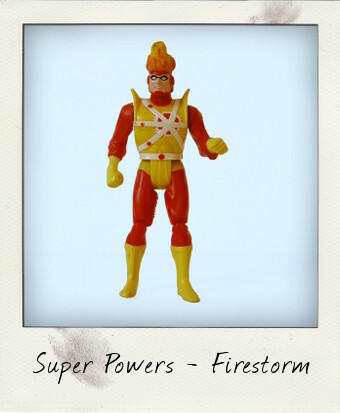 This has inspired me to take a look back at another classic Firestorm figure from one of my own absolute favourite vintage action figure lines – the Kenner Super Powers. 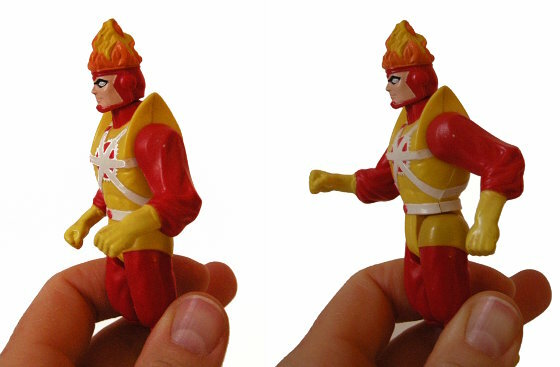 Kenner's utterly cool version of Firestorm first appeared in 1985 as part of the second series, and was closely based on Al Milgrom's designs in the comic book. Compared to other DC Comics characters in the Super Powers line, this character was somewhat of a new kid on the block back then, having first appeared only seven years earlier in Firestorm, the Nuclear Man, with Ronnie Raymond and Martin Stein as his dual identities. With Firestorm also a regular member of the gang in Hanna-Babera's Super Friends: The Legendary Super Powers Show and its sequel The Super Powers Team: Galactic Guardians animated television shows, as well as the star of a revamped comic The Fury of Firestorm which ran for most of the decade, it can safely be said that the 1980s were a great time for Firestorm! Squeeze his legs together...to activate the Power Action Atomic Punch! Like almost all the Super Powers figures he stands 4 ¾ inches tall, but this includes his flaming coiffure, making him one of the shorter figures in the series if one looks at shoulder height. He has the usual seven points of articulation at the neck, shoulders, hips and knees, and as with all the other figures in the Super Powers Collection, Firestorm also has his own built-in gimmick – if you squeeze his legs together he'll still land a Power Action Atomic Punch. Over 25 years later this power action still works just fine – Kenner sure knew how to build great toys! The carded figure came with no accessories, but there was the usual mini-comic which paired Firestorm alongside another second wave hero Green Arrow against the evil Mantis. I used to have this guy as a kid.I really want to start collecting these at some point.These figures were a lot of fun! it’s still amazing how great these were… and still are! Nice coverage! I love the Firestorm Super Powers action figure! Kenner did an amazing job capturing the likeness and fun of the character!